as well as Lake Quillelhue. In the sector of Puesco there are two noteworthy topographical occurrences; the Las Peinatas hill, approximately 2,000 meters high, a great place for climbing; and the Colmillo del Diablo (Eye Tooth of the Devil) hill, otherwise known as Quinquilil, 2,050 meters high. lenga. The un-wooded sections are areas of recent lava flow, with hardly any vegetation. The fauna of the park is very varied due to the quantity of different atmospheres present here, making it possible to find coypu (the largest of Chilean rodents), chilla (small fox), culpeo (a larger type of fox), quique (a type of weasel), and skunk. In the most wooded areas the pudú and cougar can be found. Amongst the aquatic birds here are the haula, common tagua, caique, royal duck, cortacorriente, the rinconero, and many others. You can also find the following birds of prey: hawk, eagle, peuco, vari, and the peregrine falcon. The basins of the rivers Trancura, Cavisani, Palguín, Turbio, Claro, Voipir, Llancahue, Reyehueico and Lizán are all very beautiful, as well as the Comanahue, Callupén, Diuco and Tralco brooks. The park’s rainy season is between March and August, and the snow zones reach 2 meters in height. Between January and March the minimum temperature is 9ºC, the lowest recorded between May and August is 4ºC. 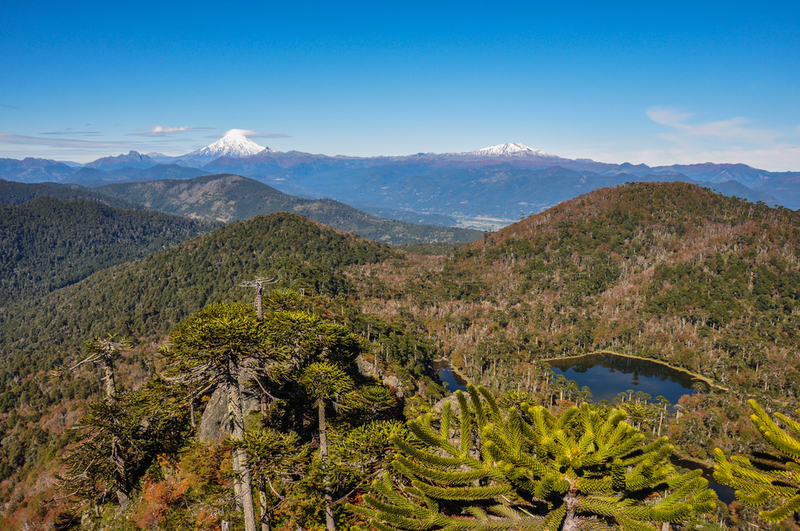 This park takes in the sectors of Pucón and Curarrehue and a little of Panguipulli. The park is divided into three districts: Rucapillán, Quetrupillán and Puesco. You can also reach the park from Palguín Bajo, in the Chinay sector, an hour’s drive, and from the Puesco sector located 56 km from Pucón towards the mountain range, half an hour’s journey away. The administration center of the park is found in Pucón at 1355 calle O’Higgins.